Scuba Center is an authorized Thermalution Dealer. Diving is a sport that is a combination of exploration, adventure, excitement and unfortunately, sometimes cold. What if there was a way to remove cold from the equation? Enter the Thermalution Compact Dive Series; replacing the cold with an unparalleled blanket of comfort. There are some things in life that cannot be controlled. Don't let the temperature of your Compact Dive Series be one of them. The waterproof controller allows you to command it to heat up or cool down during your dive. Toastiness is served. In order to optimize the heating performance of the Thermalution, they strongly advise customers to wear smaller fitted sizes of the Thermalution. Please refer to the size chart above to find the recommended size of Thermalution for you. Push the battery connector through the hole of the battery pocket at the bottom. Place the battery inside the battery pocket. 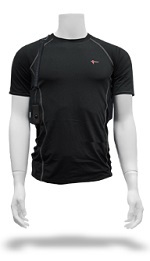 Connect both connectors and wear the Compact Dive Series undersuit. Operate the Temperature Micro-Controller. Push button upward once to adjust temperature setting.